We will carpool/caravan from here. Please note that parking space is limited at the trail head area. PARKING FEE: There is a $7 fee from opening until 10:00 AM ($5 all other times) in the Claremont Wilderness Loop Hike metered parking areas. HIKE WALKTHROUGH: From the meeting point we will drive to the trail head which will take us about 5 mins. From the entrance of the trail for the first mile we will be on fairly leveled and somewhat shady section. From the beginning we’ll be at approximate elevation of 1800 feet. From this point we will start going uphill and will be exposed to sunlight for the rest of the hike. The next three miles involve a steady paced gain at a good workout steepness with an eye for bicyclists coming around tight bends. 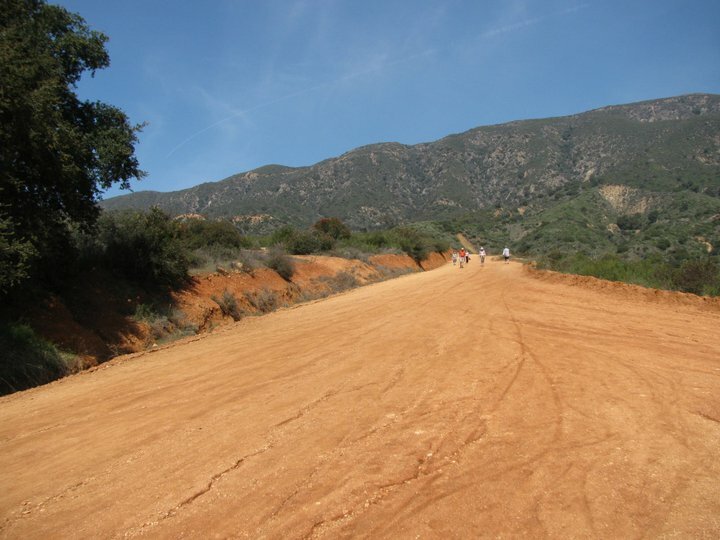 There is a grand view of red rock and dirt which give this trail a different feel. We’ll reach an elevation of 2400 feet. An overall a gain of 600 feet. Once it levels out we’ll reach a gazebo area which we will call our midpoint. From there will start to descend for the next two miles until we get to the trail entrance. RECOMMENDED: Light-colored clothing to keep cool, comfortable shoes, sun block/screen, hat (for hot days). DOG-FRIENDLY? : Yes, but must on kept on a leash. Bring water and drinking container for your pet.